You purchased a Goalscape Online Unlimited monthly subscription, which means you can sign in to the Online web application, create (or upload) an unlimited number of projects of unlimited size and share them with anyone you like. To download the templates from our Templates page, just click the Download link (or right-click it and select 'Save Target As...'/'Save Link As...'), then Save the .gsp file somewhere on your hard drive. Please note that you may need to enforce the '.gsp' suffix when you do this (some OS try to change it to '.txt' or '.xml' in the Save window). 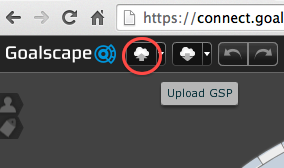 In Goalscape Online you can Upload the .gsp files from their location on your hard drive using the 'up into the cloud' button at the top of the screen (see screenshot): they will open as new projects in your workspace. If you have trouble with any of the above, or if there is something else you need to know, please post again.